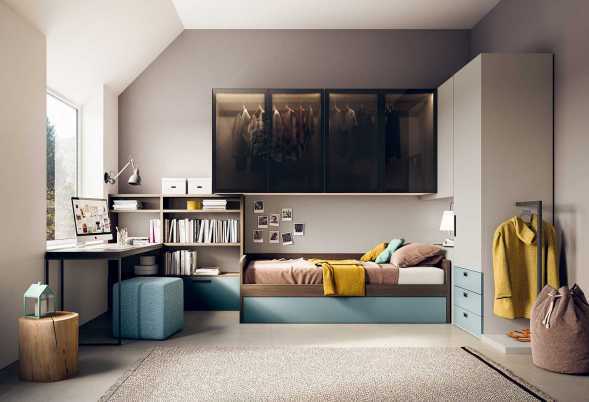 If you look for space saving ideas for small bedrooms or for children sharing bedrooms, our first tip is: think vertically. Whether with fitted wardrobes or wall-mounted shelves, you can always gain a lot of room by strategically using the wall instead of the floor. Since storage is essential, a wardrobe with bridging units can be of great help when it comes to teenagers and kids rooms. Overbed fitted bedroom furniture takes advantage of a wasted space that is usually under-used, but with these wall mounted cupboards every bit of wall space counts. If you don't like the look of it or you don't feel comfortable adding storage units above the bed, you can always opt for a study area where a run of bridging cabinets is placed above the desk and bookcases. If you want to get more out of a small kids bedroom you need to carefully plan its design and layout, making good use of vertical space in order not to steal inches from the room footprint. To help make yours and your kids' life a little easier we have designed a full collection of modular furniture made for you to customize and even cut to size. 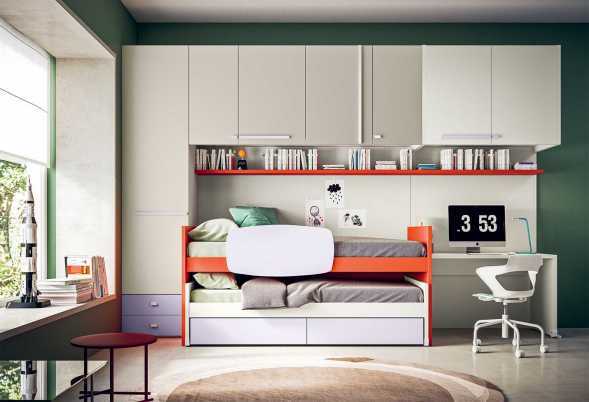 Clever space saving children and teens' furniture must be designed to maximize storage deprived spaces. When it comes to your young ones' bedroom, storage is key and you need to go bold with it: use bigger furnishings instead of putting together a pastiche of small sized pieces. Remember that nothing makes a room feel smaller than cramped floors and clutter. The secret is to use vertical space with wall shelving, floor-to-ceiling units and modular wardrobes that make the most of every inch, no matter how little footage you have. 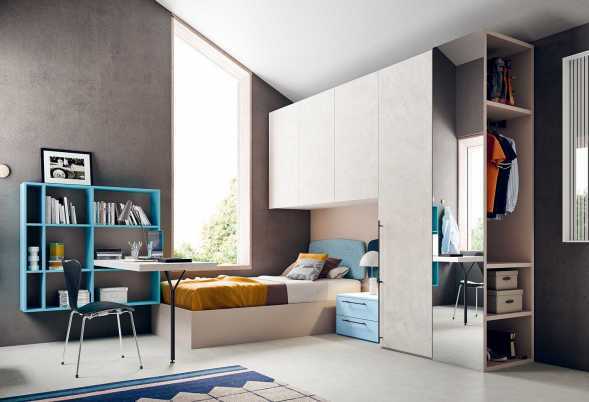 Thanks to fitted wardrobes and bridging units like overbed cupboards or floating storage nooks, you will be able to create a functional bedroom set with lots of free room to play, hanging out with friends, study and work. Besides, using all vertical space gives an impression of expansiveness. Style wise, go for a light colour scheme or add mirrors to the wardrobe doors: details that will make the small bedroom feel airy and larger. A large wardrobe with drawers and overbed storage is by far one of the best solution to store clothes, shoes, bedding and accessories such as backpacks and bags. 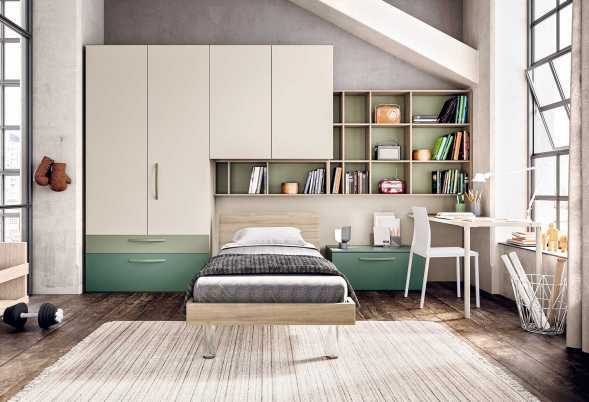 However, a small or shared bedroom might still be short on storage spaces. You just need to sharpen your design senses and start thinking of all those spots that are often left to themselves: with the right pieces of furniture even a bed headboard can become an extra container, not to mention the extra storage you can fit under your kid's bed. Floating shelves, wardrobes with built in chest of drawers or bookcase, coat racks and other clothes hanging options to add to your modular wardrobe, are just a few multi-functional organizers you can use to make full use of your interiors. Boys' bedroom set complete with wardrobe, Start P16 is the perfect solution for teen or young ones. Furniture includes overbed units, bookcase, desk, bedside table and single bed with clear legs. 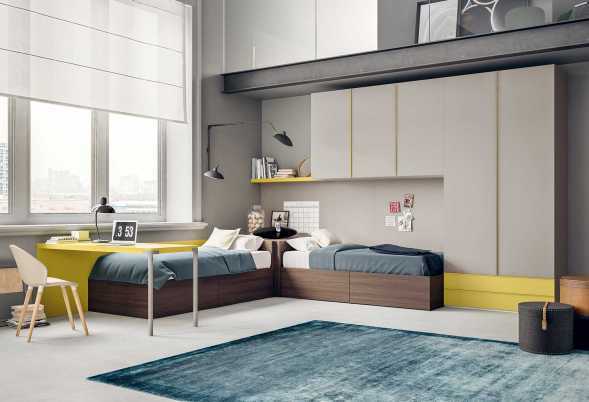 With its corner layout Start P17 is a cool boys bedroom set with desk and bookshelf. 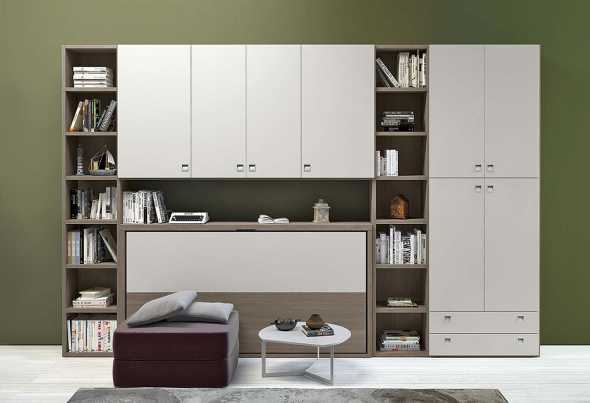 Complete with wardrobe with coat rack, overbed storage units, single low bed with wall paneling and bedside table. 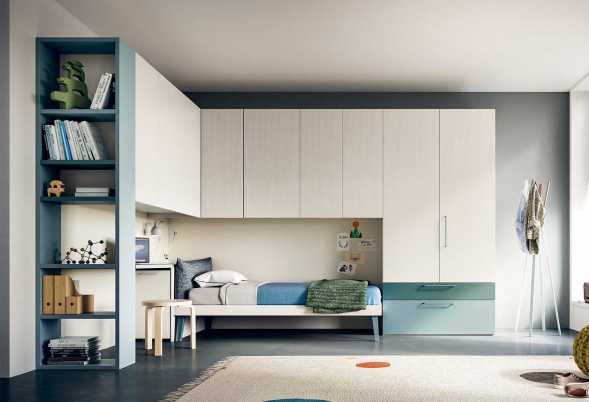 Start P18 is a great solution for a small bedroom for one child. With its wardrobe with built in coat rack unit, desk and single bed, this bedroom set provides everything a young kid need. Kids' bedroom with cabin bed Start P19 is the perfect solution for a girl or boy's small room. The set of furniture features a platform bed with drawers, a study area and overbed wardrobe. All on one wall. 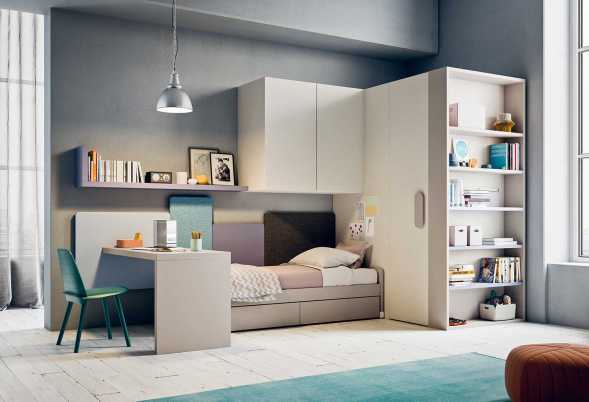 Great space saving idea for shared kids’ rooms, the Start P20 bedroom set with l-shaped beds, large wardrobe and desk, features everything boys and girls need to rest, study, store their clothes. 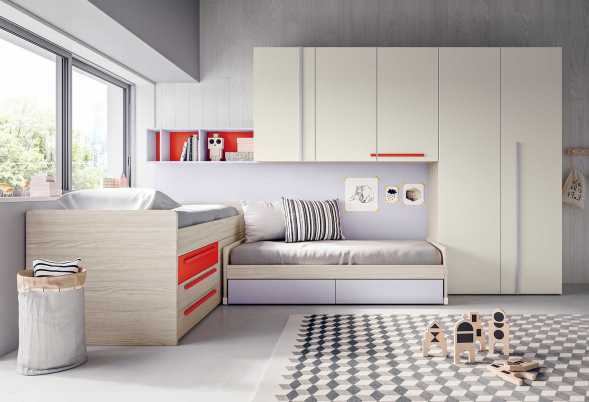 Start P21 is a smart space saving trundle kids' bedroom set with mid-sleeper bed and lower pull out bed. Ideal for shared or guest rooms, is complete with desk and overbed wardrobe. Start P22 boys' bedroom set with desk and bookshelves. 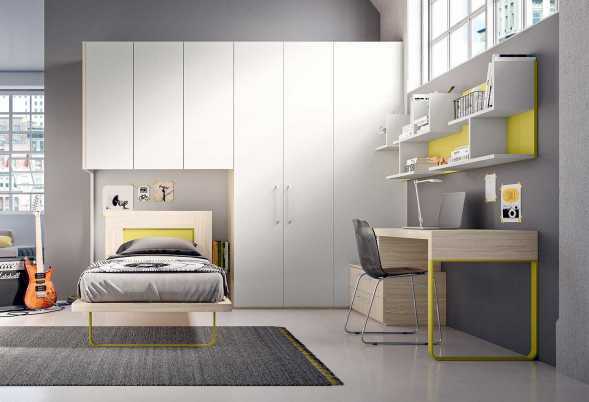 Featuring a corner wardrobe with over bed units and a sleek single bed, it is the perfect solution for a school or teenage boy. Kids' corner wardrobe bedroom set with single bed, desk with spacious cabinet underneath and bookcase. Start P23 will help your boy or girl to make the most of their room. Many colours available. 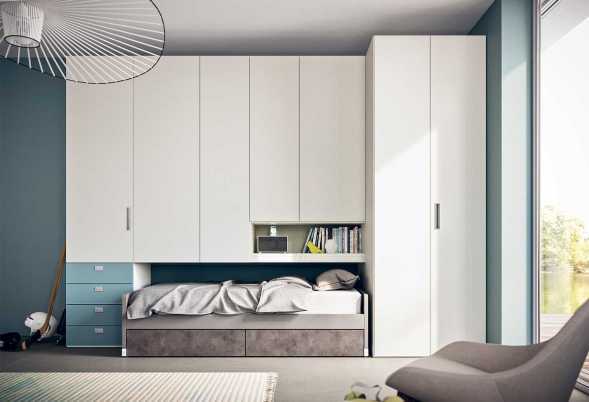 If you are looking for space saving bedroom furniture for kids, the Start P24 set with overbed wardrobe and bed with drawers is the perfect solution for boys, girls or for a guest bedroom. Start P25 is a complete set of girls' bedroom furniture with walk-in closet, bed with drawers, desk, shelving and overbed 2 door wardrobe cabinet. Wide choice of colours for boys and girls. A true space saver, this innovative girls bedroom furniture set for small rooms features two cabin beds and a spacious two door wardrobe complemented by three overbed storage units. Start P27 is a modern teenage girl bedroom set with a sophisticated corner wardrobe with smoky glass overbed units, a day bed with trundle and a corner desk bookshelf combo. Dynamic Day #8 is a kids bedroom furniture set including a hideaway bed, a bridge bookcase with doors and a cabinet with drawers. Dynamic Night #1 is a bedroom with two hideaway beds, one coming with built-in desk. It includes a corner wardrobe with bridge unit. Dynamic Night #4 fitted bedroom set with hideaway bed and single upholstered bed. It includes a bridge wardrobe and a bookcase.